When guests visit Moss Mountain Farm, it is more than just looking at flowers and gardens, it is an experience where you become completely immersed. Moss Mountain Farm is an epicenter for promoting the local food movement, organic gardening and the preservation of heritage poultry breeds, while serving as a place of inspiration, education, and conservation. Of course, what I love more than sharing my home with folks from all over the globe are the stories you all share with me during your visit. One of my favorite stories from this spring was of a family who found their way to Moss Mountain Farm from Mississippi thanks to their adorable 8 month old son. Their son would awaken each morning at 5:00, and the parents would turn on the television to try and wake up as well. 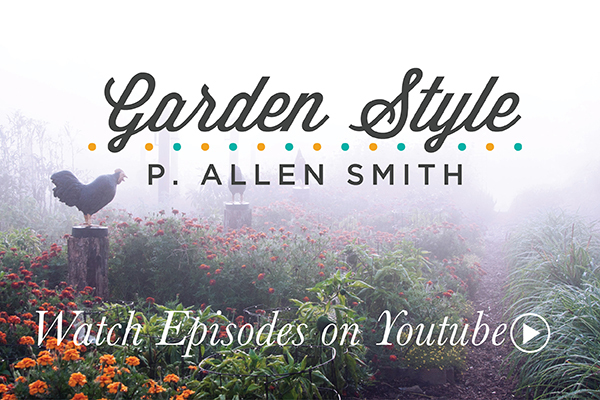 Garden Home is shown in the early hours of the morning, and that’s how the parents became inspired by P. Allen Smith. This day, they were among 63 guests who came from 17 states to visit the farm. I am also appreciative of those who trek through the rain and sludge. This is a group of 84 guests from 18 states enjoying a rainy day at Moss Mountain Farm. One of my favorite events at Moss Mountain Farm takes place in the fall and spring, when flocks of poultry enthusiasts gather at the farm to learn more about conservation of heritage breed poultry. Each day at Moss Mountain Farm is different, and I love seeing guests participate in the variety of activities we have planned throughout the spring and fall. One of my favorite tours recently was a “make it and take it” class, where the tour attendees were able to paint their own flower pots to bring home with them. To learn more about our upcoming tour dates and to reserve your spot, click HERE!